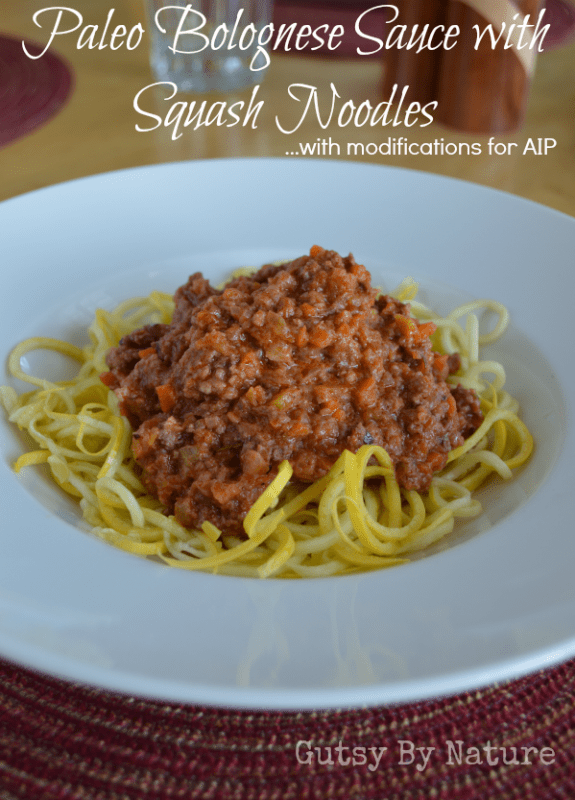 My husband has been working to perfect this bolognese sauce for a long time and it broke his heart when I told him I was going on the autoimmune paleo protocol (AIP) last year and couldn’t eat either noodles or tomatoes! So we put our heads together and came up with a way to make a paleo bolognese sauce compatible with AIP but still retain the taste he had fine tuned. The noodle issue is easy to solve if you have a spiralizer. This is the brand we have and have been very happy with. Typically we make zucchini noodles, or “zoodles,” but this week our Trader Joe’s had some restocking issues due to bad weather in the northeast US so I was only able to get yellow summer squash. It actually worked really well and I rather liked the yellow color better than the slightly green tint that zucchini noodles have. One difference is that the yellow squash has more seeds, so you might want to cut and scoop them out before beginning the spiralizing process. The other big issue was the tomato sauce. Enter “nomato” sauce. While I was on the elimination phase of the diet I was determined to perfect my own version but ultimately decided that others had done it so well that I didn’t need to keep trying. If you want to make your own, you can try this recipe from the Urban Poser. But an even easier and tastier option is to buy a pre-made nomato sauce and hands down, the best sauce is made by the chefs at Paleo On the Go. They ship anywhere in the United States and this sauce is a great thing to stock your freezer with so you have it on hand whenever your Italian food craving hits! If you are able to eat tomatoes (consider yourself lucky! ), then you can use my husband’s simple tomato sauce in this recipe, which follows the main recipe below. Paleo autoimmune protocol (AIP)/ The Paleo Approach: Use your favorite “nomato” sauce, select the pumpkin puree option instead of tomato paste. Do not add the optional jalapeno peppers or the black pepper. Low-FODMAP: Omit onions and garlic but use garlic infused olive oil for flavor. Specific Carbohydrate Diet (SCD): No changes necessary. 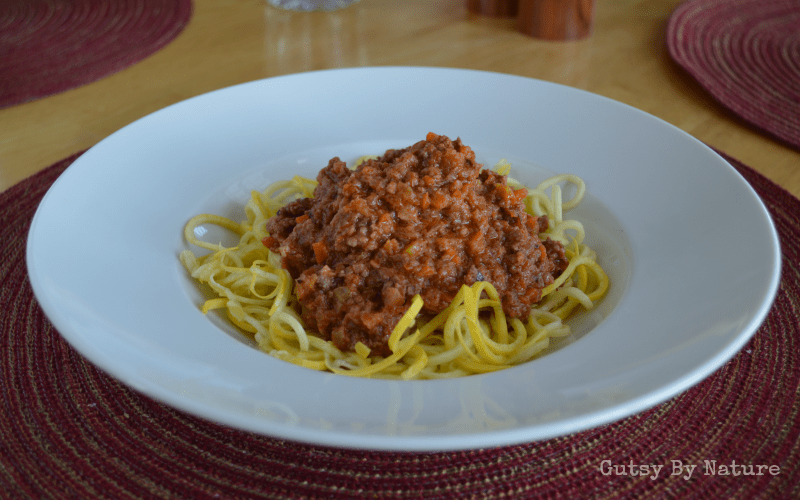 This paleo/primal bolognese sauce packs a ton of taste and modifications are suggested for making it AIP-compatible. Over medium to medium-high heat in a large skillet, cook pancetta or bacon until fat is rendered and pancetta is crisp. Remove with a slotted spoon and set aside, leaving fat in pan. Add olive oil, celery, carrot, rosemary, and sage. Cook until carmelized, about 15 minutes. Add the garlic and cook until fragrant, about 2-3 minutes. Pour in the white wine to deglaze the pan and scrape up any browned bits. Cook until the wine is reduced and the pan is almost dry, about 5 minutes. Add the ground meats and cook, breaking into small pieces, until no pink remains, about 5 minutes. Add the red wine and reduce until pan is almost dry, about 5 minutes. Add the "nomato" or or tomato sauce, the pumpkin puree or tomato paste, and the reserved pancetta or bacon as well as the optional peppers, if you are using them. Lower heat to simmer and cook until thick and all flavors have mingled, about 1 hour. Adjust seasonings to taste and add coconut milk just before serving. Simple and delicious! Use in bolognese sauce or on its own. Heat olive oil in a sauce pan over medium heat. Add garlic and cook until it is golden brown but not burnt (about 3-5 minutes but watch closely!). Add tomatoes, raw sugar, salt and pepper. Stir, crushing the tomatoes with the back of a wooden spoon. Cook until the sauce is thick and no longer watery, about 10-15 minutes. Turn off heat and add basil. Like this recipe? Be sure to check out Mr. Gutsy’s other contribution to the blog so far… Braised Pork Shoulder with Pancetta and Wine Sauce. … I don’t miss flour based pasta at all…it’s been years now…. Love my yellow squash and zucchini noodles….spaghetti was always my favorite meal and still is…. This sauce is amazing! I added sautéed mushrooms and capers and a dash of 18-year-old balsamic vinegar. I put it over spaghetti squash and it was delicious. Thank you so much for posting this. I’ve been missing spaghetti so much and you just made my second month on AIP so much better! !